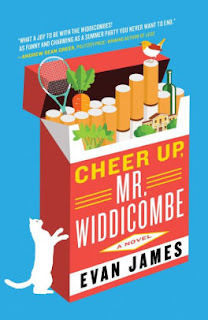 Cheer Up, Mr. Widdicombe by Evan James is a highly recommended satirical comedy. Frank Widdicombe is suffering from depression, but only according to his wife, Carol, who also contemplates other things Frank may be suffering from. The Widdicombes are a wealthy family summering at their island home, Willowbrook Manor, on Bainbridge Island in the Puget Sound. Carol is planning a garden, created and cared for by Marvelous Matthews. Self-help author Gracie Sloane is going to spend the summer with them. Their son, a painter, has just returned with a broken heart from Italy. The Widdicombe's personal assistant Michelle is enamored of screenwriter Bradford, who returns her ardor. There are employees and guests and events planned for the summer that will hopefully cheer up Frank out of his supposed depression. This comedy will strongly remind you of a hilarious and sophisticated screwball comedy in films (for example: Bringing Up Baby or His Girl Friday or Some Like it Hot), only set in the present day. The narrative features the same absurd dialogue, irreverent wit, and repartee between characters as found in these old comedic films. The novel "outlines a summer with a family that’s so neurotic they’re almost normal." In order to appreciate Cheer Up, Mr. Widdicombe, readers will need to be prepared for the comedic banter and actions of all the characters in this debut novel that does not take itself or its characters too seriously. These characters are all characterized by outlandish and absurd behaviors and dialogues. They are laughably dysfunctional, prone to follow whatever New Age thought process that catches their eye. Don't take this novel too seriously. You need to laugh at all of it in order to appreciate it. Now, at times it does wander close to being a bit too over-the-top, but on the other hand, that does make it a fun read. This is a good choice for a summer vacation read.